One of my favorite things to do at Disneyland is to look for fun new foods to try and photograph. After I shared my first list of 29 Amazing Things to Eat and Drink at Disneyland, I immediately started working on the next list. It’s a tough job but somebody has to do it:0) One of the ways in which Disneyland is different from Disney World is that both parks, Downtown Disney and the Disney hotels are all within walking distance. So it’s relatively easy to get to all of these locations no matter where you are on the property, maybe a 10 minute walk at the most. In this list, you’ll find the best of the best from all over Disneyland Resort. If you don’t see your favorite, look for it on my first list, and if you still don’t see it, leave a comment. I’m already working on a third Disneyland Food list! I’ve broken this list down into areas within the resort as well, just to keep it organized. Ok, let’s eat our way through the Disneyland Resort! NOTE: If you are planning a trip to Disneyland, you can find the best deals through Get Away Today, and I highly recommend booking your trip with them. They even have a layaway option if you want to make payments! If you use the promo code Pencil, you can save $10 off a Southern California package when you book with Get Away Today. You can even find discount Disneyland Park Tickets through Get Away Today! Disneyland Park I love working with them and recommend them to all my friends. It’s the best way to book your Disneyland vacation. 2. 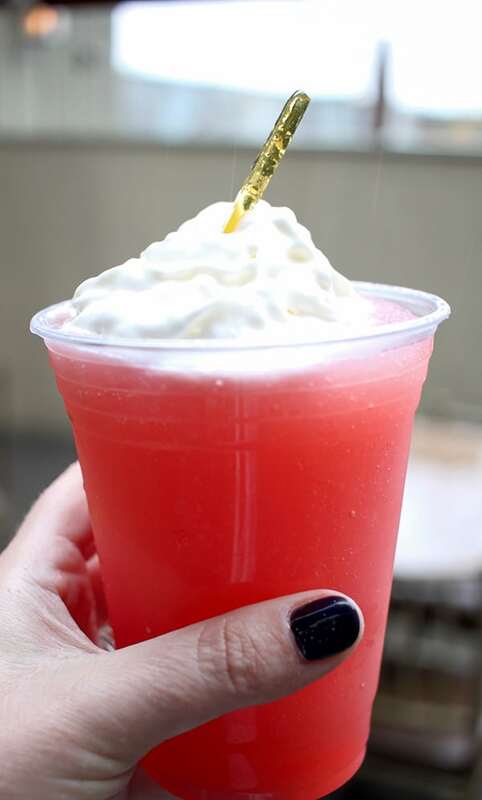 Honeybee Frozen Lemonade with Whipped Cream and a Honey-flavored icicle at Hungry Bear Restaurant – This frozen lemonade is delicious and perfect for a warm Southern California day. The honey-flavored icicle is my favorite part! 3. 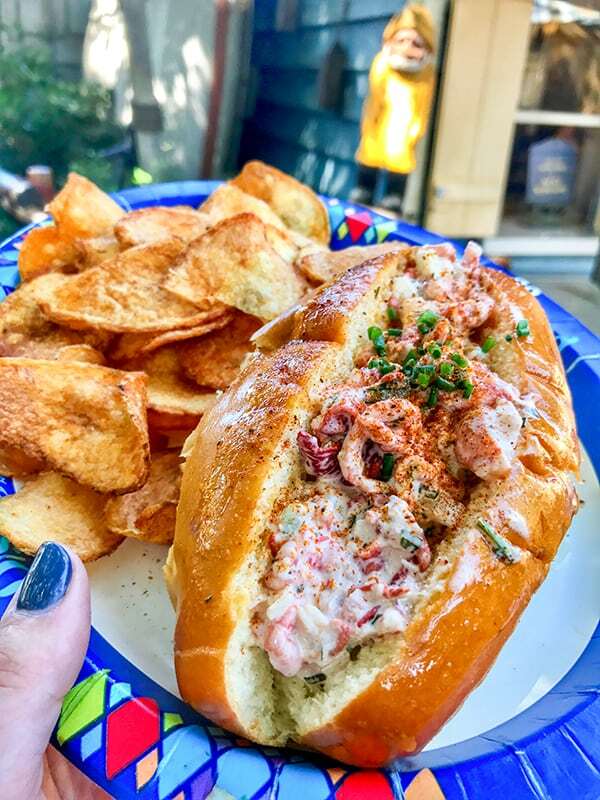 Lobster Roll at Harbour Galley – A soft buttery roll and fresh, cold lobster salad. What’s not to love? Harbour Galley is small and tucked away near the water on the way to Haunted Mansion, but the food is so tasty! A perfect on the go lunch. 4. 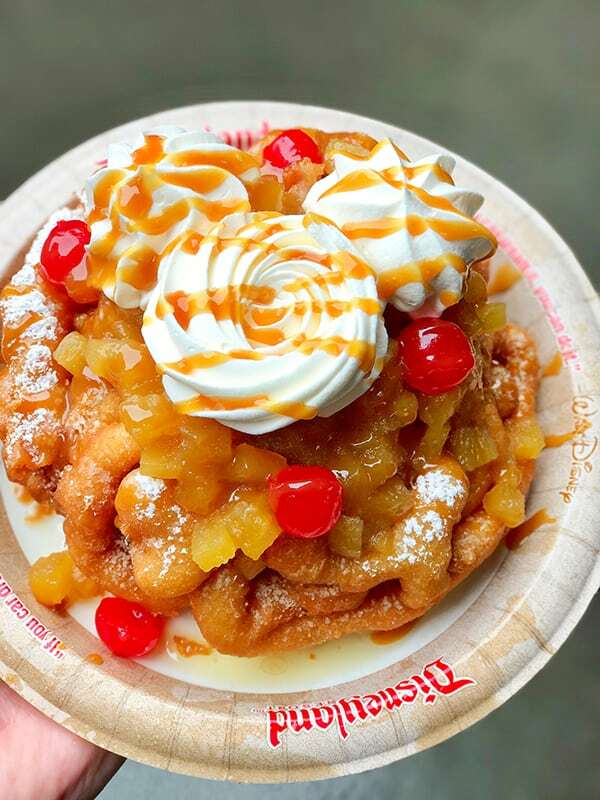 House-made Funnel Cake at Hungry Bear Restaurant – Please don’t make my mistake and avoid the funnel cake. I have heard the raves, but have never cared for crunchy fair food funnel cakes. BUT this is no ordinary funnel cake! This funnel cake is soft on the inside with a perfectly crunchy exterior. I compare it to a really fresh old-fashioned doughnut. Plus they have amazing seasonal variations, like the pineapple upside down version pictured that was available during the holidays. 5. 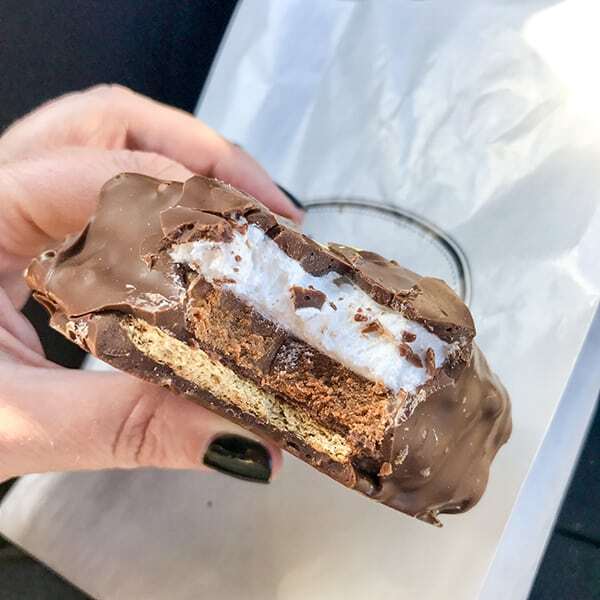 Mickey S’More at Marceline’s Confectionery in Downtown Disney; Pooh Corner, Candy Palace and Candy Kitchen in Disneyland; Trolley Treats at California Adventure – This Mickey S’More is absolutely delicious and I love taking one for the trip home. I think the picture speaks for itself. Just look at those layers! 6. 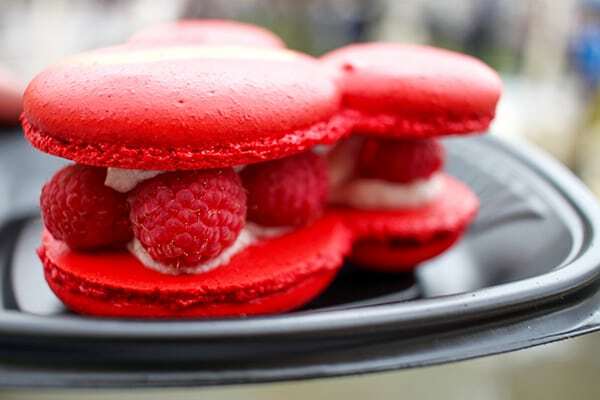 Raspberry Rose Mickey Macaron from Jolly Holiday Bakery Cafe – Oh my goodness, put this amazing macaron at the top of your must-try list! You will not believe how perfectly delicious this macaron is. Fresh, cool raspberries, lightly sweetened raspberry frosting and the perfect blend of soft, chewy and crunchy cookie. Grab one early because once they are gone, they won’t get anymore until the following day. 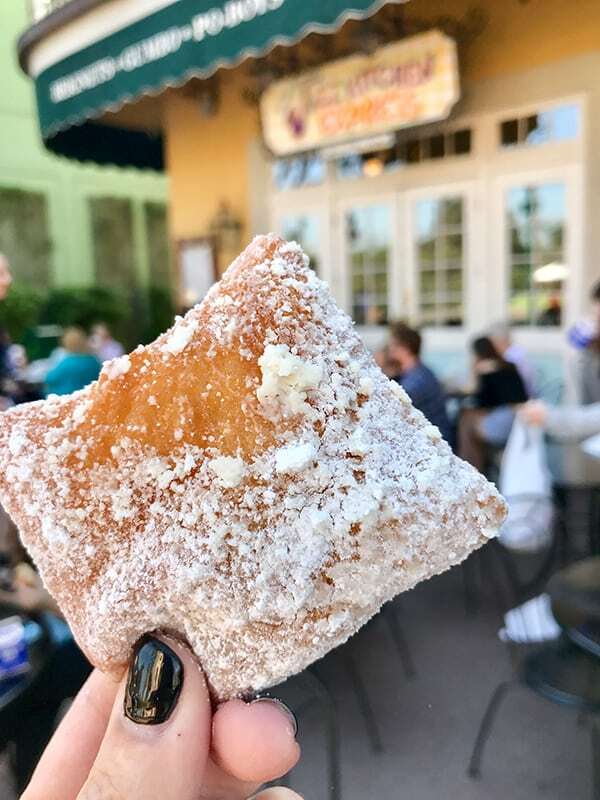 It’s the perfect sweet snack with a cup of coffee, and you can sit outside the Jolly Holiday Bakery and people watch. HEAVEN! 7. Jungle Skewers from Bengal Barbecue – If you need a tasty protein snack or light lunch before hitting Indiana Jones, these skewers are perfect. 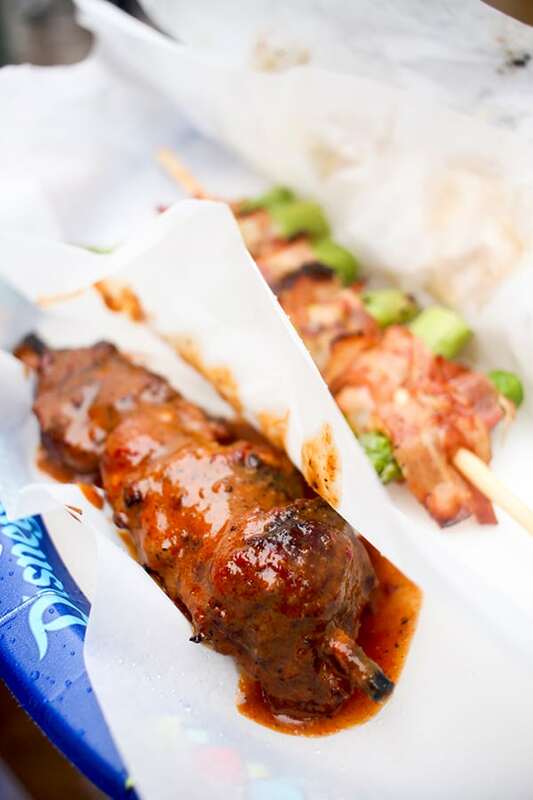 The bacon and asparagus skewer, and the steak skewer are especially tasty. 8. 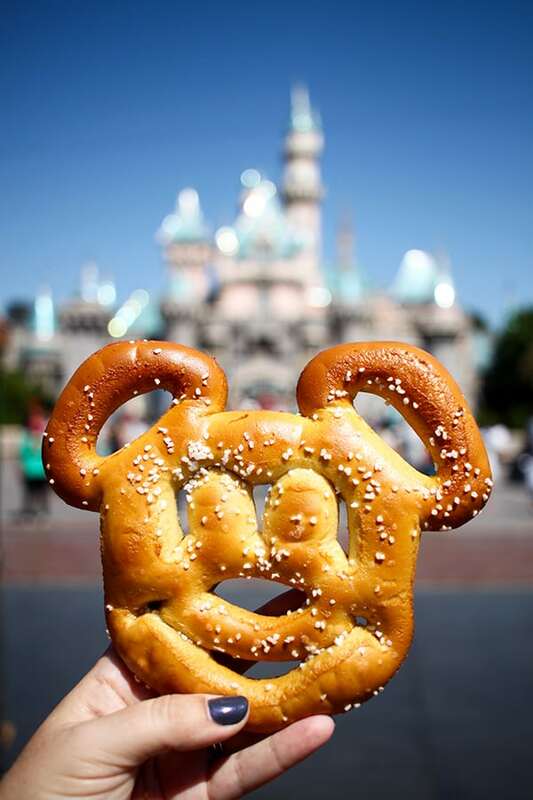 Mickey Pretzel from Pretzels Carts at Disneyland Park and Disney California Adventure Park – It’s a nice soft pretzel and I’m pretty sure the fine print on the receipt calls for it to be Instagrammed as partial payment. Just look at that adorable Mickey face! 9. 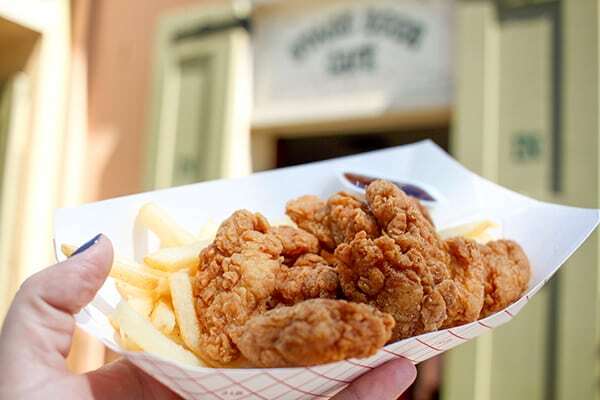 Chicken Breast Nuggets from Stage Door Cafe – Yes, these are chicken nuggets, but they are really good chicken nuggets! If you have a little one, or a grown-up, who is a picky eater, they are practically guaranteed to love these chicken nuggets. 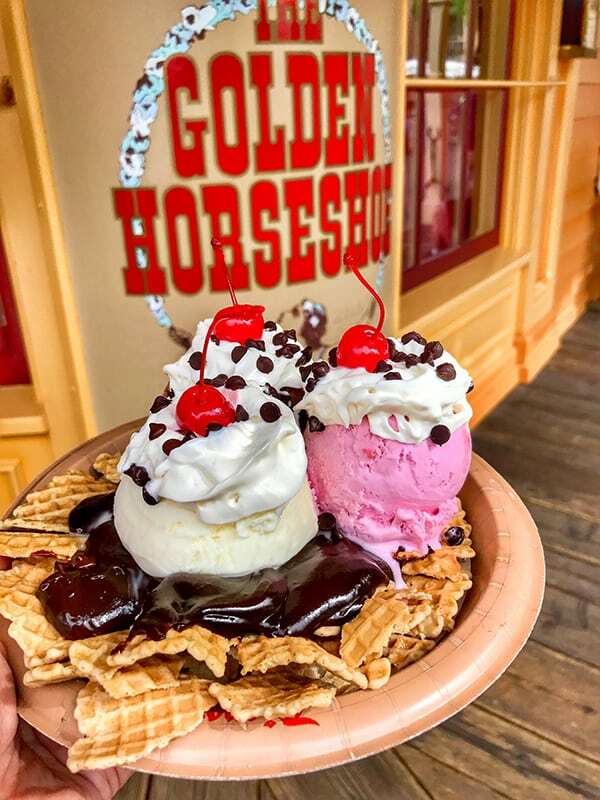 You can also find these at The Golden Horseshoe and follow it with some Ice Cream Nachos for dessert! 10. 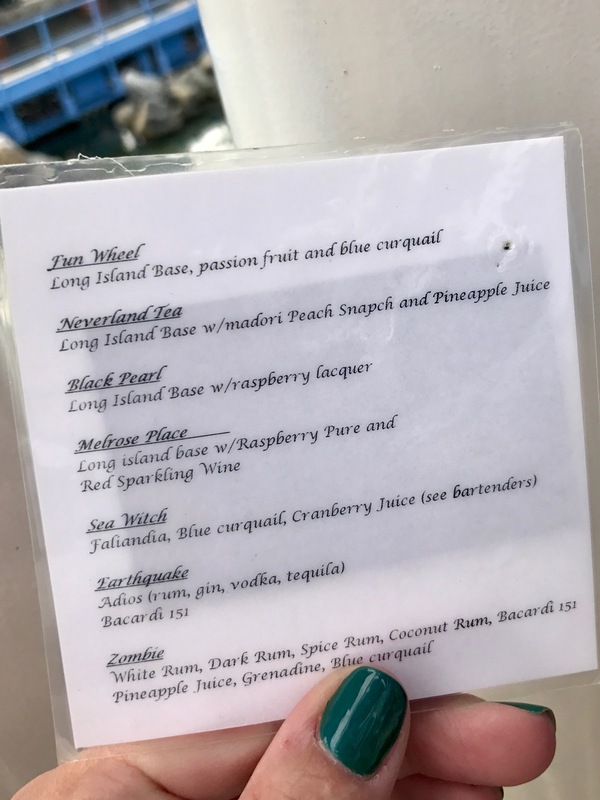 Secret Menu Drinks at Cove Bar – There is the menu at Cove Bar and then there is the secret menu. 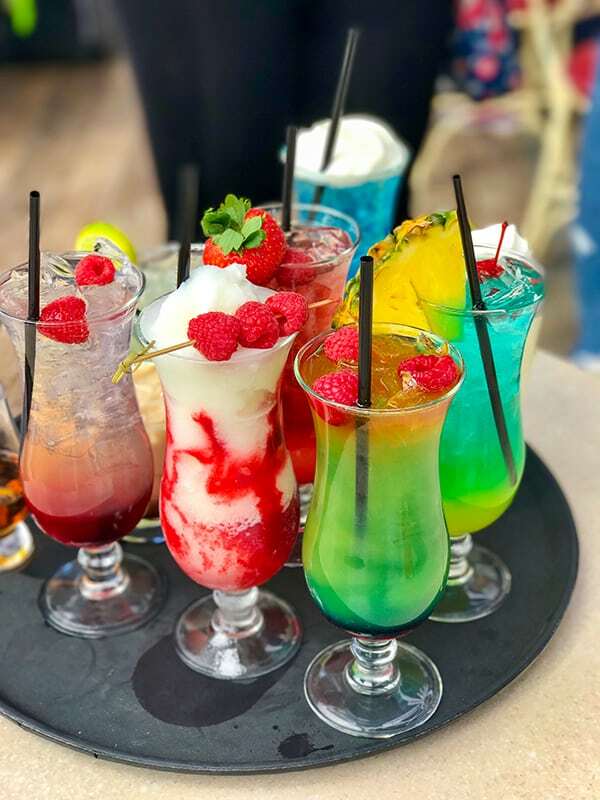 All of the drinks pictured above are from the secret menu at except the white and red Pina CoLava in the middle. One of our servers was kind enough to let me take a picture of his secret menu cheat sheet. Not all the servers have these, so I reccomend knowing what you want to order ahead of your visit! Update – Cove Bar has closed. Hoping similar drinks will be available soon at the new Lamplight Lounge opening soon at California Adventure. I recommend the Fun Wheel and the Zombie! Pair these with the Lobster Nachos for an out of this world Disney meal! 11. 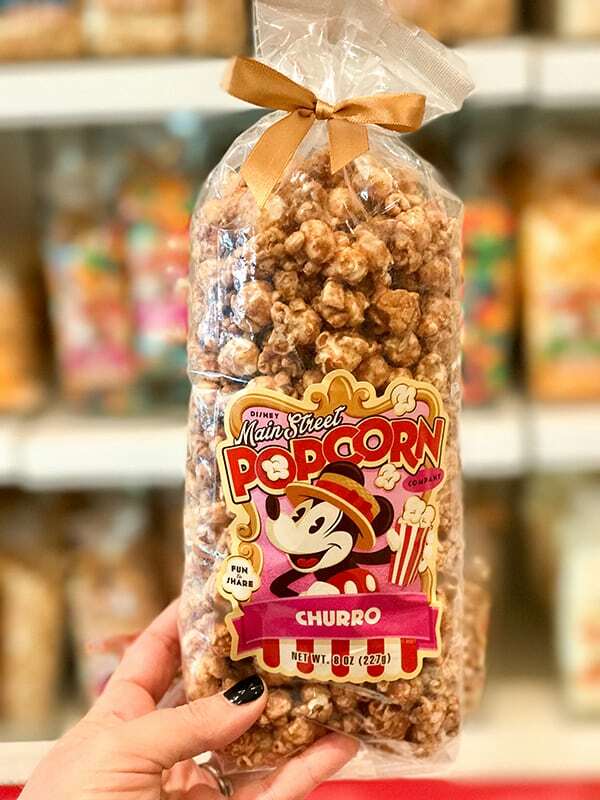 Churro Popcorn from Marceline’s Confectionery in Downtown Disney; Pooh Corner, Candy Palace and Candy Kitchen in Disneyland; Trolley Treats at California Adventure – You can find these in several shops, and it’s great for taking home to a churro loving friend! 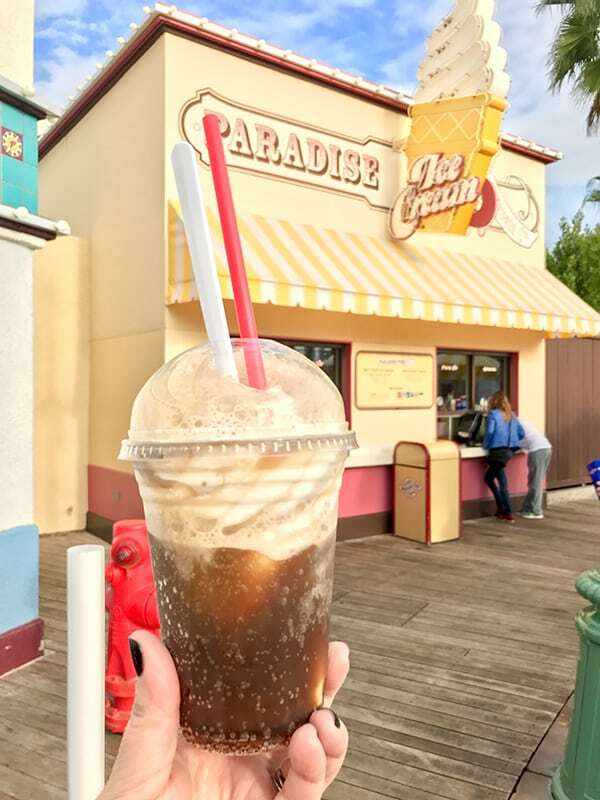 12.Beachfront Floats at Paradise Pier Ice Cream Company – the soft serve at Disneyland is just so delicious! Perfectly creamy and sweet, and it makes the best Coke or rootbeer floats! 13. Cold Beer from the Karl Strauss Beer Truck – Tucked away in the back of the Pacific Warf area is the Karl Strauss beer truck. Karl Strauss is a San Diego based craft beer brewery, and all the brews are delicious. 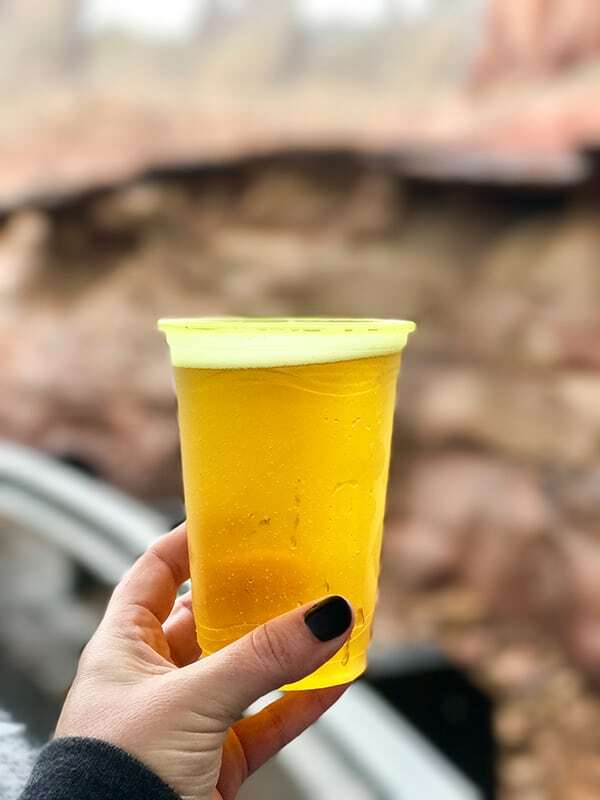 The beer truck can also be easily visited from the back of Cars Land. 14. Carthay Martini at Carthay Circle Restaurant – These hand crafted cocktails are a must try from Carthay Circle. The ice spheres are specially made for Carthay circle and only available in these two drinks. 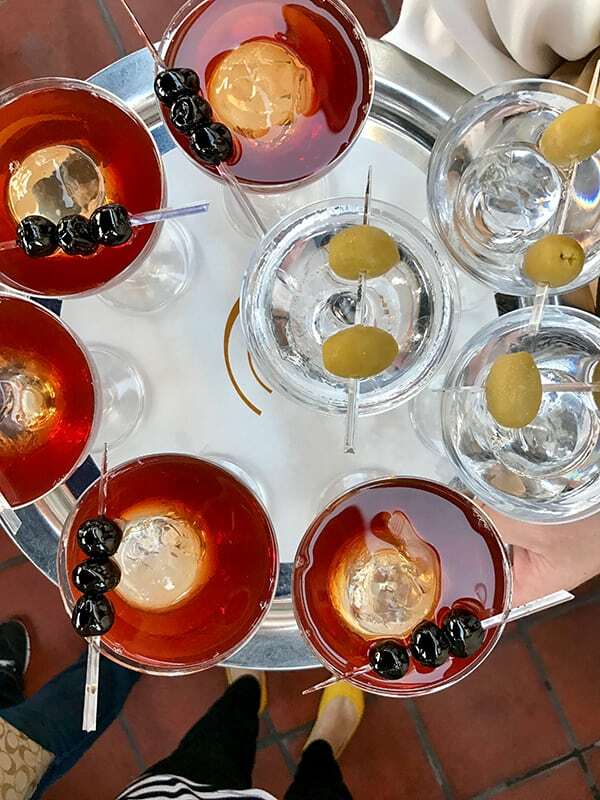 15.Carthay Diamond Manhattan at Carthay Circle Restaurant – The Luxardo maraschino cherries in the Manhattan are an absolute must try! My favorite part! 16. Carthay Signature Fried Biscuits at Carthay Circle Restaurant – Stuffed with white cheddar, bacon and jalapeño and served with an apricot honey butter, these biscuits are addictive and Carthay Circle’s signature appetizer. I highly reccomend everything on the menu and booking a reservation at this amazing restaurant. You won’t regret this special experience! 17. 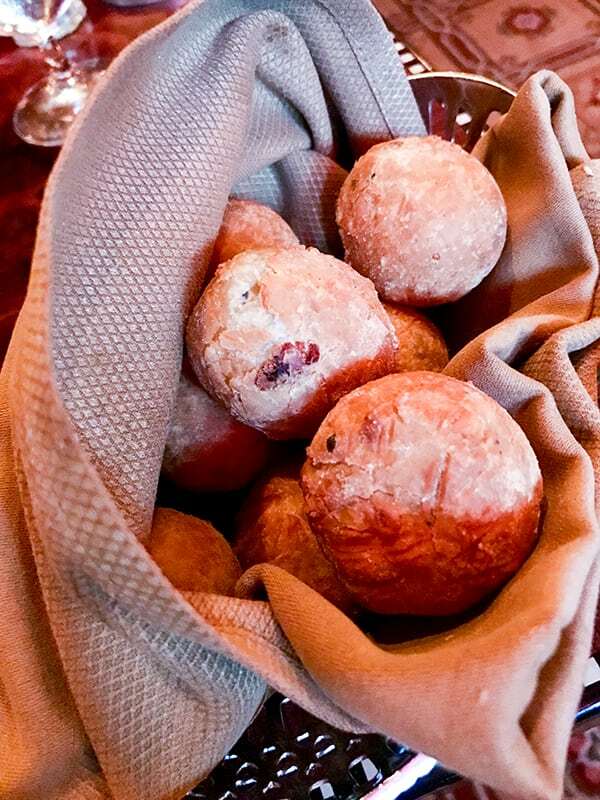 The Original New Orleans Beignets at Ralph Brennan’s Jazz Kitchen Express – These big pillowy beignets are fresh and hot, and absolutely delicious. They also have optional dipping sauces, including a delicious vanilla creme! 18. 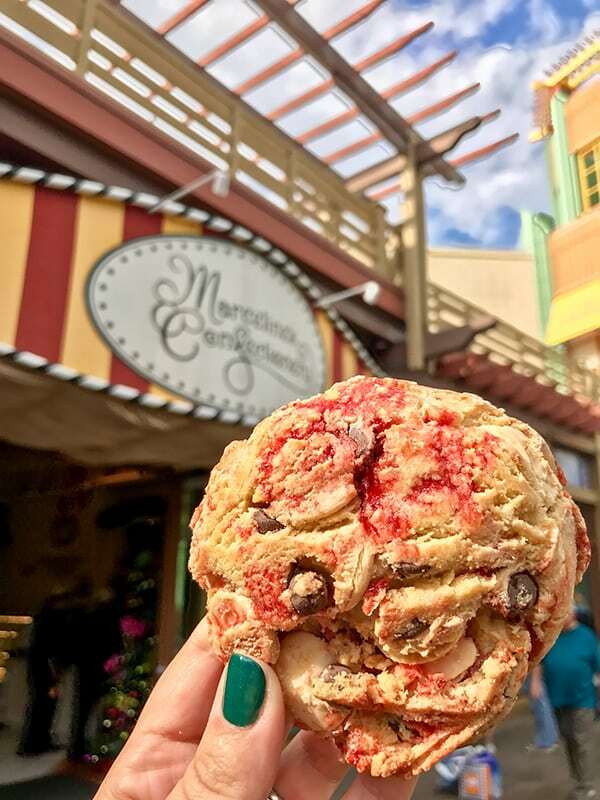 Raspberry White Chocolate Chip Cookie at Marceline’s Confectionery in Downtown Disney; Pooh Corner, Candy Palace and Candy Kitchen in Disneyland; Trolley Treats at California Adventure – The chocolate chip cookie was on my previous list, but I could not leave out this delicious raspberry white chocolate cookie. The flavor combination is just perfect, and the amazing perfect texture of Disneyland cookies is the best! 19. 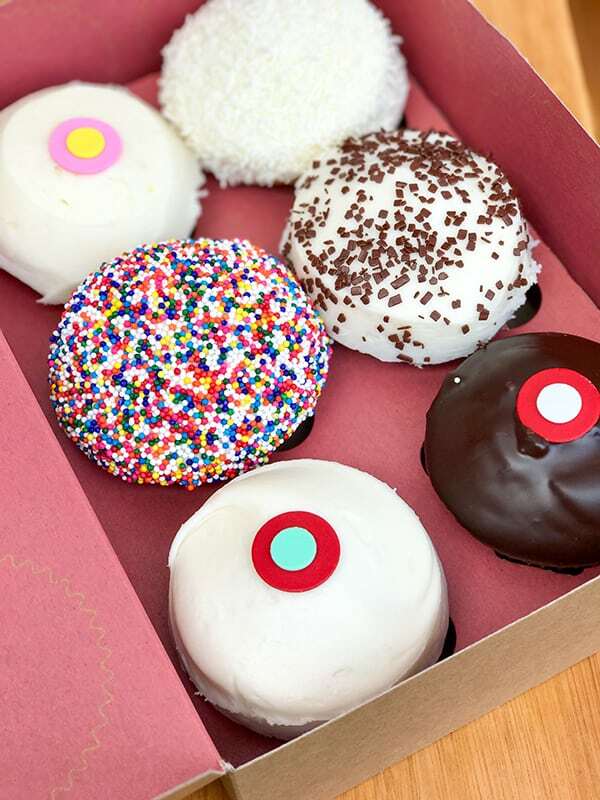 Cupcakes from Sprinkles – Sprinkles is new to Downtown Disney and they have been getting quite the welcome. There is often a line that forms outside! These are the cupcakes that started the cupcake trend, and while all of them are delicious, I think the red velvet is the best! 20. 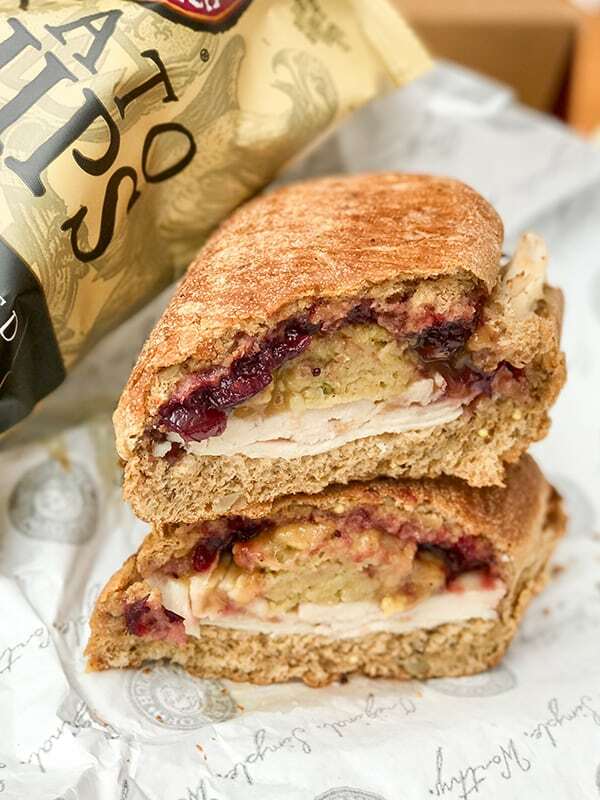 Holiday Turkey Sandwich at Earl of Sandwich – Turkey, Cornbread Stuffing, Turkey Gravy and Cranberry Sauce – this is the kind of sandwich I would never want during the holidays, but give it to me any other time of the year. This is my FAVORITE lunch at Disneyland. Though it’s at the end of Downtown Disney, which can make for a longish walk, it’s right next to the monorail. You can ride the monorail out of Disneyland, have lunch and ride back in, easy peasy. And in the afternoon, the lines for the monorail are at a minimum. Disney’s Grand Californian Hotel and Spa – All of these foods are found at White Water Snacks, an absolute hidden gem right next to the pool at the Grand Californian. You can get these to go, or you can dine in, and you don’t have to be staying at the hotel to enjoy these treats. If you are in California Adventure, you can use the hotel guest entrance to the park to pop in. Don’t be put off when you enter, it’s a little dark and sterile, but the food is killer! They also have a Coke Freestyle machine! 21. 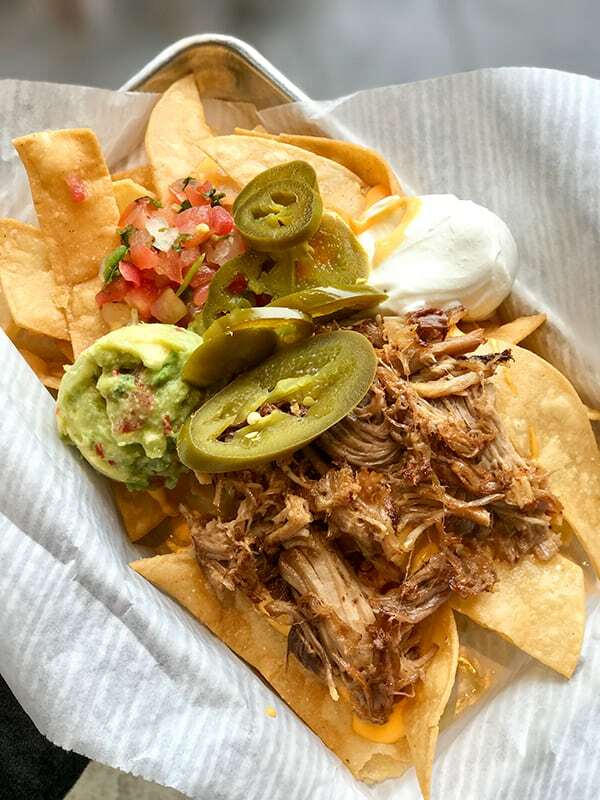 Carnitas Nachos from White Water Snacks – These aren’t technically on the menu. 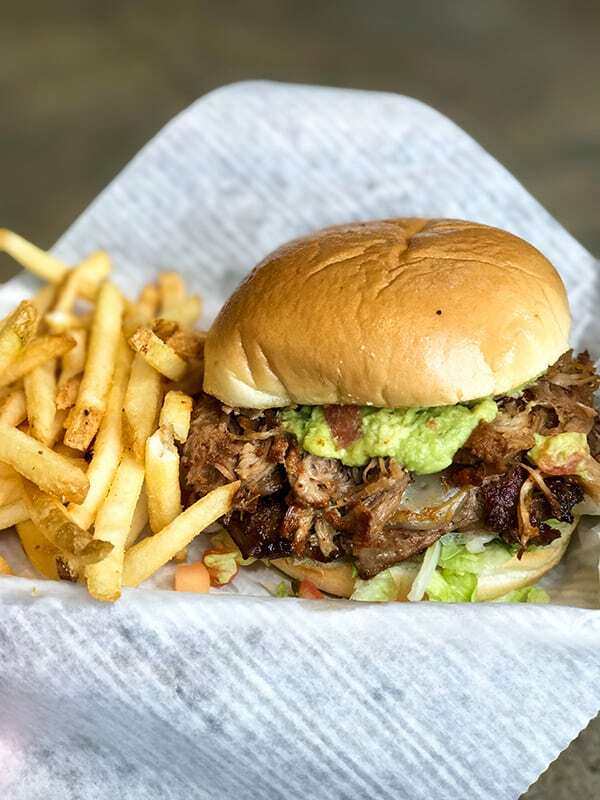 The nachos come with steak or chicken, but you can sub the delicious carnitas from the amazing burger below. You can also combo meats on your nachos if you are feeling adventurous. I just have one tiny suggestion – I would love to see Disney use shredded cheese on these nachos. The nacho cheese is good, but I think they would be out of this world with melted shredded cheese! 22. Carnitas Angus Cheeseburger from White Water Snacks – Jack cheese, tender seasoned pork, pico and guacamole. You guys, I have found the most delicious burger at Disneyland, and it comes from this tiny hole in the wall next to the Grand’s pool! Seriously, so delicious. 23. 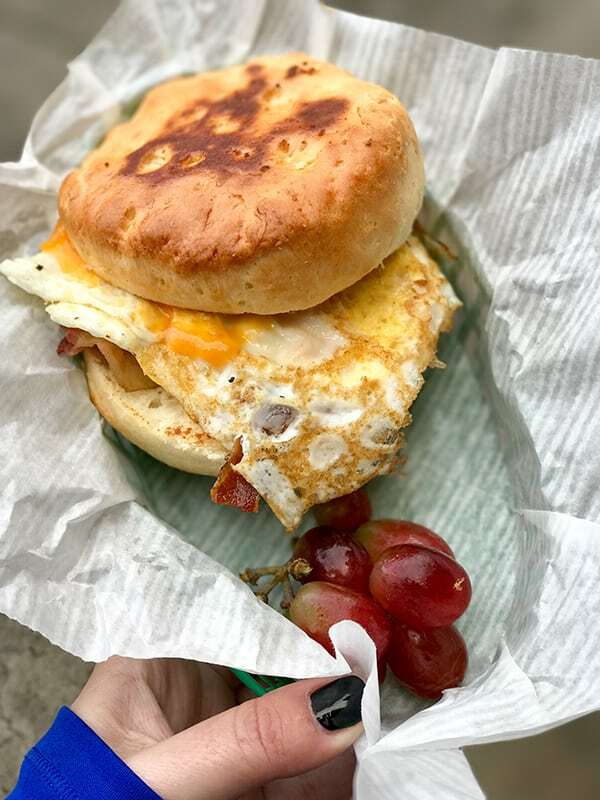 Buttermilk Biscuit Sandwich from White Water – Fried egg, smoked bacon and cheddar cheese. If you need a quick hearty breakfast, this is it. We stopped here early in the morning after the Star Wars 5k, and it tasted like the best breakfast sandwich of my life. I think it’s because I was so hungry, but it was definitely up there on the tasty scale. The biscuit is huge, so I ended up taking the top off and eating it open face style. 24. 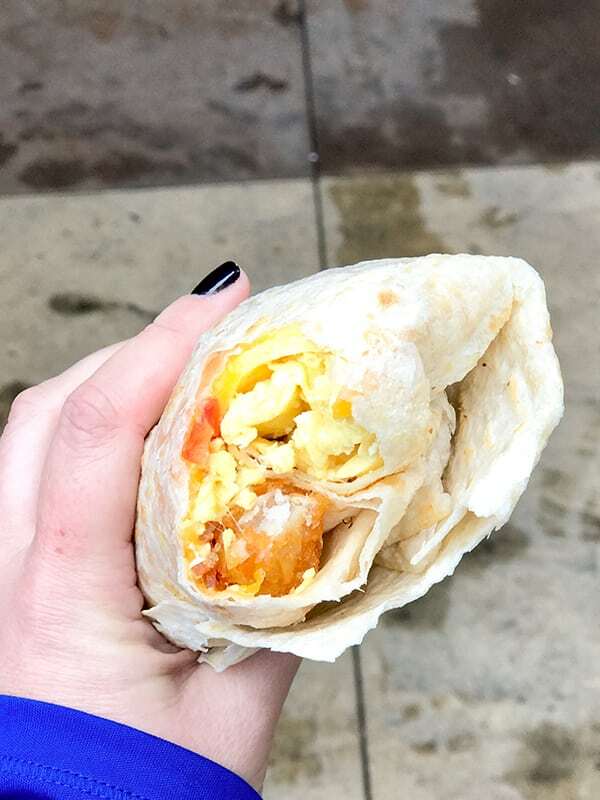 California Breakfast Burrito at White Water Snacks – Scrambled eggs, diced tomato, cheddar cheese, smoked bacon and roasted breakfast potatoes. This is one hearty and tasty breakfast burrito! 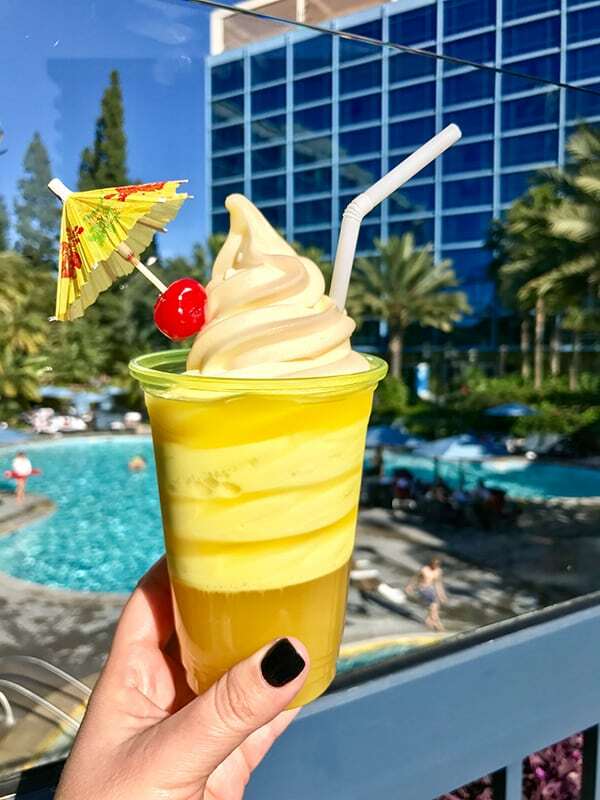 Disneyland Hotel – Again, you don’t have to stay at the hotel to take advantage of the amazing food and drinks they offer! If you hop on the monorail, you can be at the Disneyland Hotel in a flash. 25. Dole Whip Float with Rum at The Coffee House – I’m sure you’ve heard of Disneyland’s famous Dole Whip, but did you know that you don’t have to go into the park to get it? You can also get it with a shot of rum if you are feeling daring! 26. 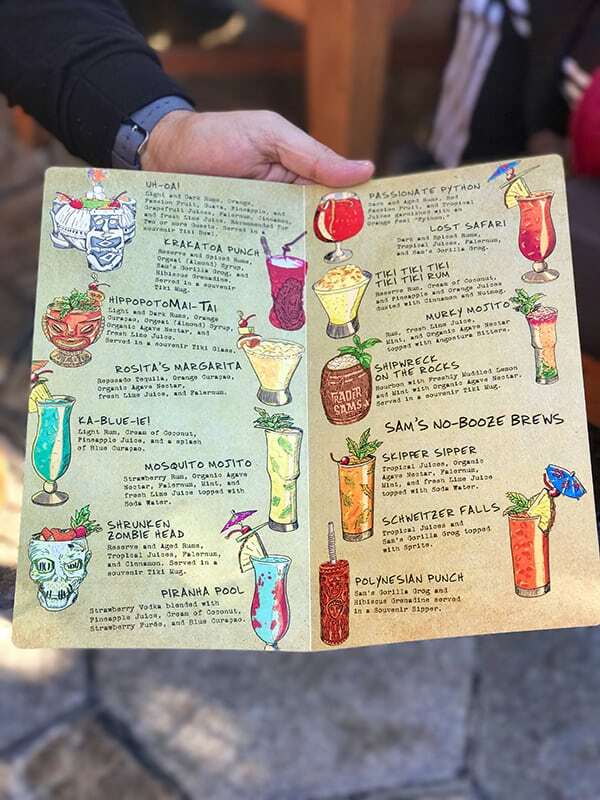 All of the specialty drinks on the Trader Sam’s Enchanted Tiki Bar Menu – I’ve saved the best for last. 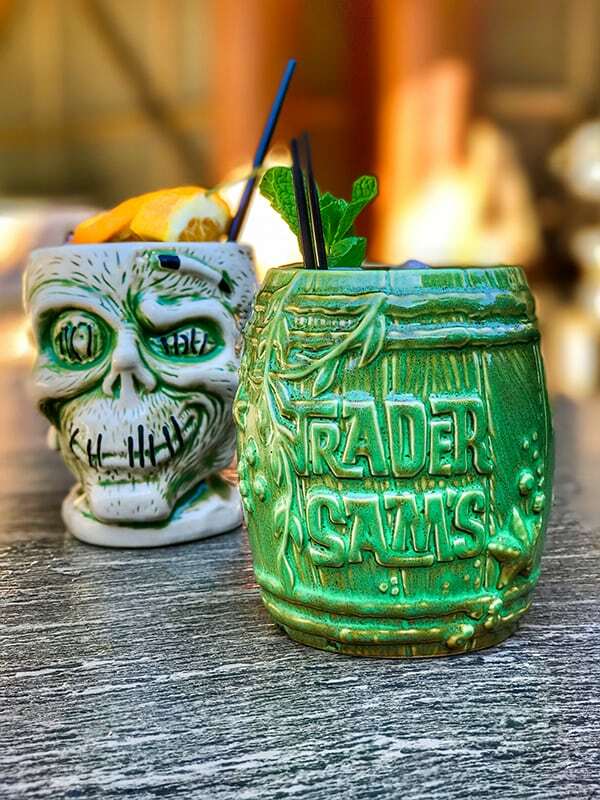 You must, must, must visit Trader Sam’s Enchanted Tiki Bar the next time you visit Disneyland. Located next to the Disneyland Hotel Pool, you can sit in the actual bar and order food and drink, or on the patio outside. If you plan on visiting, I recommend heading over before they open. Seating inside is limited, so a line starts to form outside. That’s how you know the food and drink is amazing! All of the cocktails are so delicious, I included a picture of the drink menu below. I particularly recommend the HippopotoMai-Tai. You can also purchase the fun souvenir cups. 27. 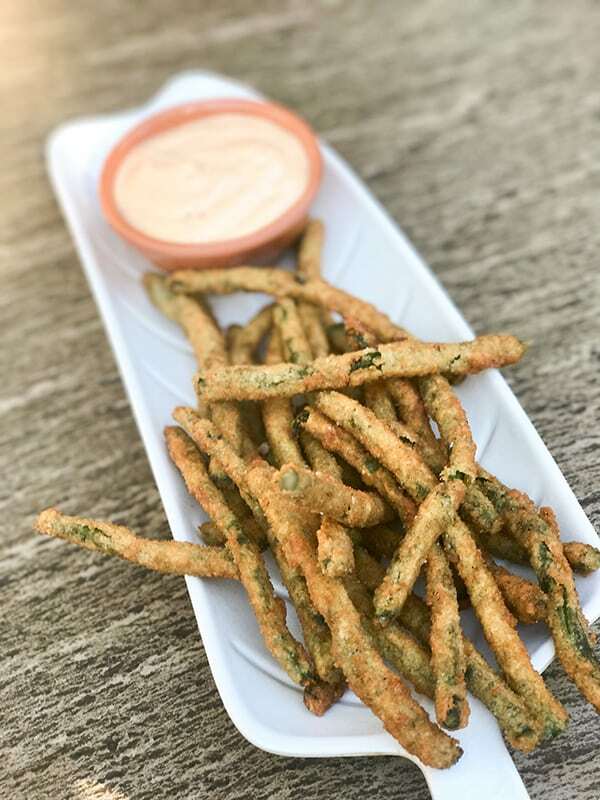 Panko-crusted Chinese Long Beans with Sriracha Aioli at Trader Sam’s Enchanted Tiki Bar – These little green beans are so savory and addictive! 28. 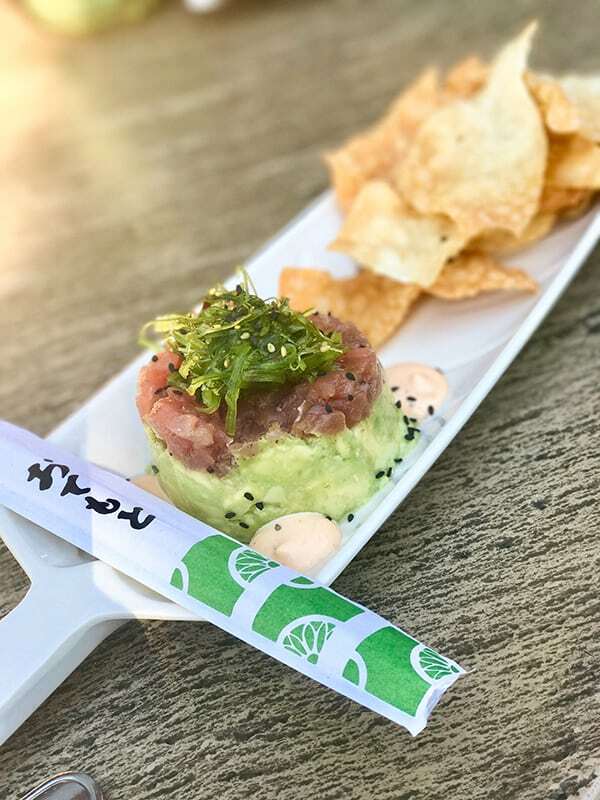 Ahi Poke at Trader Sam’s Enchanted Tiki Bar – This is the perfect light lunch or dinner. Fresh sushi grade ahi and rich avocado with a Sriracha aioli. One of my all-time favorites! 29. Hawaiian Cheeseburger at Trader Sam’s Enchanted Tiki Bar – Ok, I know I said the Carnitas Burger from White Water Snacks was the best burger at Disneyland, but actually I’m going to have to put this as a tie for first place. 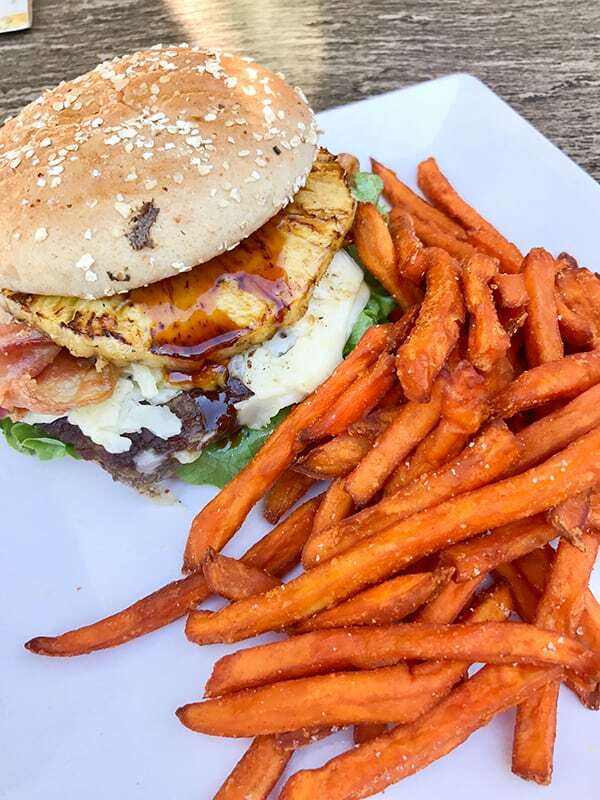 It has bacon and pineapple and comes with sweet potato fries! Update: We went to the Golden Horseshoe last Christmas. My daughter asked for the sundae, and was upset to know they were not serving it anymore. Instead, we got a cookie sundae which was delicious.